Any cat parent will tell you that we’re passionate about our felines, but we may not be so passionate about some of the behaviors that they see fit to bestow on us. For the most part, kitten bites don’t hurt, but that can change as your cat gets older and starts to bite harder. If you’re wondering, “Why does my cat bite my nose?” this is for you because we’ve scoured the internet looking for the answer to this very question. We’ll answer it along with adding techniques you can incorporate in order to train your cat not to bite, and how to tell the difference between an intentional bite and a playful nip. There are dozens of reasons why your cat could be biting your nose, and it may be slightly difficult to narrow it down to just one source. However, the following reasons will give you a good idea on why your cat is doing this, and you can start correcting the problem so you and your cat can coexist happily and peacefully. Cats can be notoriously territorial, and this extends to their humans as well as their home. 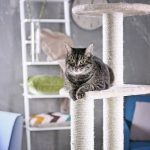 If you’ve added another cat to the family recently or if you’ve been around other cats outside of the home, your cat will be able to smell these other cats, and it can trigger their territorial instincts. Cats have scent glands all over their bodies, and by biting your nose, they’re spreading their scent all over you. This helps reassure them that they won’t lose you, and it can give a subtle warning to other cats that you are taken and off-limits for other cats to attach themselves to. Your cat has dozens of sensations coming at them from all directions 24 hours a day, and this can make it easy for them to get overstimulated. When this happens, they may act erratically or act overwhelmed and do things that they normally wouldn’t do like bite your nose. Your cat will give you plenty of warning signs that they’re getting overstimulated when they’re around you, and by stopping the contact, you can potentially stop the biting behavior. You may notice that your cat flicks or swishes their tail, rippling on your cat’s sides, rotating their ears back or to the sides, or tensing up. By nature, cats are very clean animals that can spend hours licking, grooming, and cleaning themselves and each other. This is part of the reason why most cat owners don’t bathe their cats on a regular basis, and your cat also has an excellent sense of smell that they use on you. Everything that you eat leaves a scent, and this scent can linger for hours even after you’ve wiped or washed your face. You cat may smell this because they have such an excellent sense of smell and interpret it as dirty. In response, they’ll try to clean your face, and this can result in licks along with smaller bites. When cats are young, they tend to play fight, roughhouse, and bite both with you and with their littermates. Smaller bites are an excellent way to let you know that they would like attention from you right now, and it’s a behavior they learned as a kitten. Kittens can use this when they want to play with you if they don’t have a feline playmate to engage with as well. Most cats will grow out of this behavior, but some cats find that it’s a quick way to get your attention, and so they’ll keep doing it until they have your full attention. If you’ve watched your cat from time to time, you’ve most likely observed them rubbing their face along the corner of a piece of furniture or other hard objects around your home. Your cat is very sensitive in the area around their whiskers, and getting this area rubbed feels great. When your cat bites you, it could be because your cat wants you to rub this sensitive area around the corners of their mouth by their whiskers. Put your fingers by your cat’s face and rub this area while you let them nip at your fingers in place of your face. Cats express their anger in a variety of ways, and if your cat is very angry and by your face, they may bite you on your nose to display this anger. This bite will be significantly harder than it would be if your cat is trying to give you a love bit or nip at your nose. You cat will usually give you several warnings before they bite you, and these include things like growling, their eyes will dilate, and they’ll pin their ears down or back. If this happens, you want to put your cat down and distract them with a toy or treat until they calm down. On the other hand, a soft nip or bite to your nose could be your cat’s way of showing affection since they can’t verbalize it or give you a hug as a human would. When this happens, they shouldn’t bite you hard enough for it to hurt or leave a mark. Your cat will also be relaxed when they give your this affectionate display, and they should be purring to show that they’re happy and content where they are. This varies from cat to cat, and some breeds are more prone to giving these affectionate displays than other cat breeds. Some cat owners call their cat biting them “love bites,” but cat behavior specialists call this phenomenon petting-induced aggression, and it acts like overstimulation. Petting-induced aggression isn’t very well understood, and many people don’t even realize that it exists. While no one is exactly sure what causes petting-induced aggression, experts believe that it’s your cat’s way of feeling overwhelmed and trying to take back control of the situation. Others claim that this phenomenon is simply your cat’s way of letting you know that they’re ready to be left alone, but they don’t give off any significant clues before biting, so it seems sudden. Cats can display their dominance in a variety of ways, and one of these ways is biting your nose because they know that it gets your attention. Your cat may do this once or twice, or they may do it every time that they feel that you need a reminder of who is in charge. You’ll get a good idea on whether their biting is dominance behavior or not by watching your cat’s body language before and after they actually bite you. If your cat doesn’t back down, tries to cuddle, or tries to play with you after they bite, it’s most likely a dominance display. If you’re a new cat parent, you may notice that your cat spends a lot of time touching its nose to your nose or licking your nose. Again, there are several reasons for this behavior, and people aren’t exactly sure what drives cats to have this quirk or behavior. However, one theory is that touching noses is your cat’s way of showing their owners that they’re content, happy, and that they trust them. Your cat also has an excellent sense of smell, and they can be attracted to the small food particles or lingering food scents that can stay around your face after you eat. Depending on why your cat is biting your nose, there are several things that you can do to help curtail this unwanted behavior. However, consistency is key, and you can’t view biting as cute one time, and they reprimand your cat the next time they bite you because you send mixed signals that’ll confuse your cat. When you reward or punish your cat’s behavior, it should be right after your cat displays the behavior in question. This will help your cat make the connection between the behavior and the reward or punishment. Consistency is key to your success or failure during the training process. You have to show your cat that you are in charge and that you are the dominant one. To do this, get loud when your cat bites you because they’re responsive to tone and volume. If it’s a male cat that isn’t neutered, you may want to consider neutering them. Male cats tend to calm down after they have this procedure, and they may stop biting. Start using a dominance item to curb their behavior. An example would be a rolled newspaper, and all you have to do is lightly tap them on the head when they bite you because they’ll eventually respond to just the site of it. Be very cautious and selective with your negative reinforcement. Too much negative reinforcement will make your cat afraid to try and tell you when they need something. Try to establish a less painful form of communication with your cat. Do whatever your cat wants you to do when they purr or rub against your leg, and don’t do it if they bite. Don’t be afraid to ignore your cat after the bite you. Cats love to play, and they’ll quickly start to reconsider their biting behavior if they find that it leads to getting ignored. No matter why your cat is biting you, you want to learn their body language and their tells because they’re most likely giving you several clues that they’re about to bite you before they actually do it. For example, if your cat bites you after 10 minutes of petting them, cut the petting time down to around five or eight minutes and stop. When your cat starts using less painful ways to tell you that they need something or when they stop biting altogether, reward them. Praise, treats, and petting is all excellent positive reinforcement tactics that you can use. A lot of the time if your cat bites you as an adult, they learned the behavior as a kitten. It may have been cute when your kitten nipped or bit because they were too small to do a lot of damage, but this changes as they grow and they’re able to bite you harder. If your kitten starts to bite you, you want to take steps to immediately start correcting this behavior before you have a problem. One easy way to correct biting in kittens is to blow in their face immediately after they bite you because kittens don’t like this and they’ll start to associate it with biting. Also, don’t be afraid to wear your kitten out by distracting them with a toy. With kittens especially, biting is a sign that they’re ready to play with you and introducing a toy is a viable distraction. You may also want to consider getting another kitten for your kitten to play with because they’ll exhaust one another and they hopefully won’t bite you. The bottom line is that biting can be cute when your cat is a kitten, but it can lead to a bloody mess when your cat gets older and gains the ability to do damage when they bite. Train your cat young, be consistent, and reward their good behavior.